KopiemTu is an Lubuntu Linux-based mining distribution for Nvidia GPUs that has been available for quite some time already. The latest KopiemTu 3.0 that was just released however brings support for the latest generation of Nvidia Pascal-based GPUs – the GTX 1000 series. It comes with CUDA 8.0 support and GeForce GTX 370.28 driver, including support for overclocking or underclocking some GTX 1×00 GPUs. The whole mining distribution should fit on a 16GB USB flash drive making it easier to deploy and use without the need of a dedicated hard drive for the mining rig. 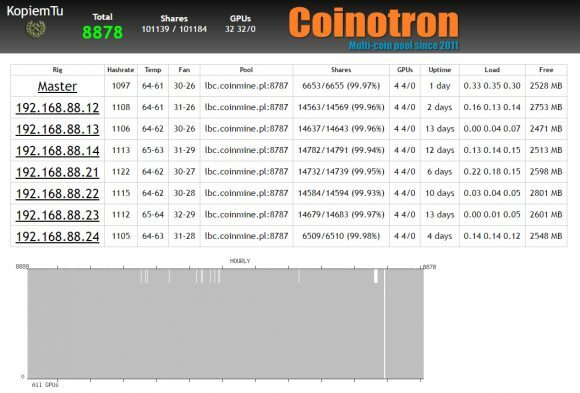 There is a simple yet convenient web-based monitoring of your mining rigs activity available, so it is easy to keep track of them without the need to connect to each and every one of them. The distribution relies on ccMiner and the default version is apparently compiled for Pascal GPUs, though you can apparently easily configure it to be used with older Nvidia GPUs. KopiemTu is an interesting project that aims to make it easy for people with Nvidia-based video cards such as GTX 750 Ti for example to be able to start mining crypto currencies under Linux. 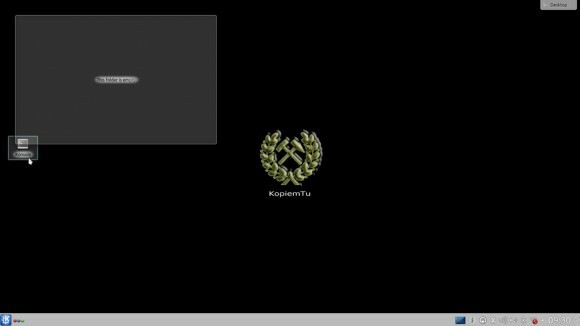 KopiemTu is based on Kubuntu and comes in the form of a bootable image that you can put on an 8 GB or more USB flash drive and directly boot from it, no need to install it. It includes Nvidia drivers and CudaMiner compiled for Linux, so as soon as you boot it you can start mining. There is also a simple web-based monitoring service available that you can watch remotely without having to login to the Linux machine to check the status. And while KopiemTu is not yet like BAMT or SMOS Linux mining distributions it still makes it easier for people that are not very familiar with Linux to start mining. What is kind of missing at the moment is an easy way to configure and use the live distribution without having to rely on console commands. When you start you are presented with an empty desktop and an icon only for the console, but no easy to use icons to automate the most common tasks, you still need to go to the console, switch to root user and edit a configuration file to set your pool settings (config files stored in /etc/kopiemtu/). Even a wallpaper with the most common things you need as commands or a ReadMe file on the desktop would be nice for new users. What you need to know to get you started is that the root password is live, and you start and stop the mining by typing the “mine start” command in the console, after setting your settings in the config file for the pool you want to mine in. with “monitor start” you are activating the web-based monitoring that you can see from a web browser by typing the IP address of the system. The good thing is that since CudaMiner does support most of the crypto coins algorithms you are easily able to configure settings for different coins without having to recompile something for example. The only problem that is common under Linux and is also present here is the overclocking of the GPUs, the solution to that problem is to modify the video BIOS with the overclocked frequencies and flash it on the video card(s), so that the right settings will be applied all the time. 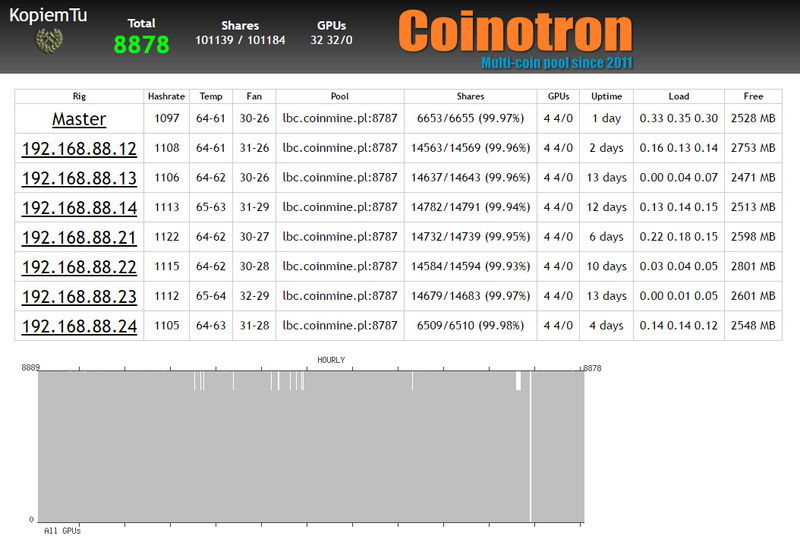 – For more information and to download and try the KopiemTu Linux live mining distribution….